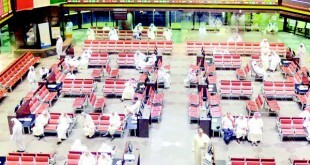 KUWAIT CITY, Sept 30: Kuwait stocks headed further south on Wednesday to wind up the month on a gloomy note. The price index dipped 25.24 pts to 5,725.96 points weighed by selling in select mid and small caps. Some of the banks extended the gains while other heavyweights remained subdued. The KSX 15 barometer slipped 4.74 pts to 935.06 points taking the month’s losses to 84 pts while weighted index edged 1.32 pts lower. The volume turnover meanwhile fell slightly after receding in the last session. 121.16 million shares changed hands – a 9.8 pct drop from Tuesday. The sectors closed mostly in the negative zone. Technology outshone the rest with 2.67 pct gain whereas industrials shed 1.51 pct, the biggest loser of the day. In terms of volume, financial services clocked the highest market share of 40.74 pct while real estate and banks followed way behind with 20.87 percent and 16.8 pct contributions respectively. Among the day’s performers, National Bank of Kuwait rose 10 fils to KD 0.810 on back of over 3 million shares and Commercial Bank of Kuwait followed suit to end at KD 0.600. Kuwait Food Co (Americana) slid 60 fils to KD 2.280 and Humansoft Holding plunged 100 fils. Telecom major Zain gave up 10 fils to close at KD 0.395 but has gained 25 fils during the month while Wataniya Telecom (Oordeoo) held steady at KD 1.000 after vacillating in a tight range. Kuwait Telecommunications Co (VIVA) paused at KD 0.860 and Agility closed 10 fils in red. Investment conglomerate KIPCO was unchanged at KD 0.590 and National Investments Company followed suit. The company has recorded a net profit of KD 3.80 million and earnings per share of 4.46 fils in the January-June period of 2015. The market opened flat and moved sideways in early trade. The main gauge remained tame almost half way into the session and swung lower as sentiment turned weak. It bottomed at 5,713.1 pts in the final minutes before trimming back some of the losses at close. Top gainer of the day, Qurain Holding Co vaulted 13.33 pct to 8.5 fils while Kuwait Bahrain International Exchange Co climbed 8.47 percent to stand next. Metal Recycling Co dived 18.75 pct, the steepest decliner of the day and Al Madina For Finance and Investment topped the volume with 16.9 million shares. Mirroring the day’s decline, the market spread was skewed towards the losers. 35 stocks advanced whereas 50 closed lower. Of the 124 counters active on Wednesday, 39 closed flat. 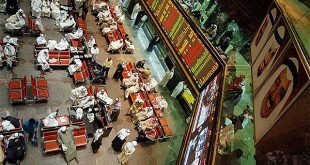 2,951 deals worth KD 15.23 million were transacted – a 4.24 pct drop in value from the day before. National Industries Group was unchanged at KD 0.146 while Heavy Engineering Industries and Shipbuilding Co was up 8 fils at KD 0.140. Kuwait Cement Co added 5 fils to end at KD 0.355 whereas RISCO closed 5 fils lower. Jazeera Airways rose 10 fils to KD 0.470 taking the month’s gain to 25 fils and ALAFCO clipped 2 fils. Al Nawadi Holding Co closed 5 fils lower at 79 fils. Boubyan Petrochemicals Co jumped 30 fils on back of 1.79 million shares and Automated Systems Co gained 20 fils. The company has recorded a net profit of KD 503,093 and earnings per share of 10.05 fils in the first six months of 2015. Kuwait and Gulf Link Transport Co inched 0.5 fils down whereas KGL Logistics Company rose 4 fils. The company has posted a net profit of KD 3.49 million and earnings per share of 5.82 fils in the first half of 2015, up from net profit of KD 2.73 million and earnings per share of 5.06 fils in the same period last year. ACICO Industries Co slipped 5 fils whereas Kuwait National Cinema Company closed flat. The company has clocked a net profit of KD 5.98 million and earnings per share of 62.65 fils in the six-months period ending June 30,215. Equipment Holding Co ticked 1 fil lower. Qurain Petrochemical Industries Co and Mashaer Holding Co dialed up 2 fils each while Burgan Well Drilling Co shed 20 fils. United Projects Co fell 10 fils whereas Independent Petroleum Group climbed 10 fils to KD 0.35. In the banking sector, Kuwait Finance House was down 10 fils at KD 0.570 erasing the gains on Tuesday while Gulf Bank paused at KD 0.270. The bank has posted a net profit of KD 18.7 million for the first half of 2015, up 20 percent from KD 15.6 million in H1, 2014. Al Ahli Bank of Kuwait was up 5 fils at KD 0.340 and Ahli United Bank rose 10 fils . Kuwait International Bank held steady at KD 0.228 and Burgan Bank followed suit to close at KD 0.385. Boubyan Bank ended 5 fils in red. Kuwait Investment Co was flat at KD 0.106 and Commercial Facilities Co pulled 8 fils lower. 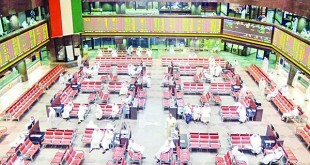 Securities House and Al Deera Holding Co dialed up 1 fil each and Noor Financial Investment paused at 63 fils. National Real Estate Co fell 4 fils while Mabanee Co was down 10 fils at KD 0.860. Al Mazaya Holding took in 2 fils to settle at KD 0.104. The bourse has been largely negative so far during the week and has shed 28 points in last three sessions. It has dived 94 points during the whole of the month and has retreated 12.39 pct year-to-date. 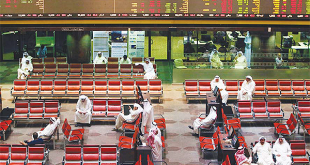 KSE, with 213 listed companies, is the second largest bourse in the region. In the bourse related news, Kuwait Real Estate Company has registered a net profit of KD 2.39 million and earnings per share of 2.64 fils in the first six-months of 2015 as against net profit of KD 3.49 million and earnings per share same of 3.86 fils in the same period last year. Gulf Cement Company has posted a net profit of KD 2.45 million and earnings per share of 0.003 fils in the first half of 2015, down from KD 3.36 million net profit and earnings per share of 0.004 fils in the same period last year. Al Dar National Real Estate Co has incurred a net loss of KD 132,850 and loss per share of 0.32 fils in the six-month period ending June 30, 2015 as against net profit of KD 761,352 and earnings per share of 1.85 fils in the same period of 2014. Metal and Recycling Co has incurred a net loss of KD 126,449 and losses per share of 2.48 fils in the January-June period of 2015 as compared to net profit of KD 615,409 and earnings per share of 6.76 fils in 2104, H1. Aayan Leasing and Investment Company has clocked a net profit of KD 5.42 million and earnings per share of 6.76 fils in the six-months period ending June 30, 2015, down from net profit of KD 8.88 million and earnings per share of 11.07 fils in the H1 of 2014.